There were an amazing number of pubs in Openshaw. Looking at the pictures posted on the Openshaw Facebook page, it appears that there is a pub every fifty yards or so. Thanks to Antony Broughton for the list. The image here names 45, and that isn’t all of them, because there were two on Cornwall St, where I lived, that are not listed. Those were the Napoleon and the Jenny Lind. As an aside, I always thought that calling a pub after a major British enemy (Napoleon, not Jenny Lind) was odd, a bit like calling a pub the Hitler. But there you go. There were also at least two Working Men’s Clubs, one on Cornwall St, one on Stanley St.
Two questions come to mind; why so many, and how did they all make a living. Most of them would have been built in the late 19th century, following closely the building of Openshaw and the influx of workers for the engineering factories. Factory hours were long, and there was no evening entertainment. Cinema didn’t get going until the 1920s, newspaper readership was low, and the growth of free lending libraries had only just started. Home was not necessarily a comfortable environment, often poorly furnished and crowded. The pub offered some relief to the worker. But ale had to be paid for out of meagre wages, and feeding and clothing the kids must have suffered at times. How the pubs made a living is difficult to compute. The ratio of men to pubs had to be low, judging from the number of houses and number of pubs. The customers would have been almost entirely men, women never visited pubs alone, and not often with their husbands. The pub was a serious drinking establishment, frequented by men, and unless the men spent a significant proportion of their wages on drink, it’s hard to see how the pubs could survive. It gets more difficult to understand the economics when we get to the 1940s and 50s, as there were many other things to do in the evening, and home was a much more welcoming environment. 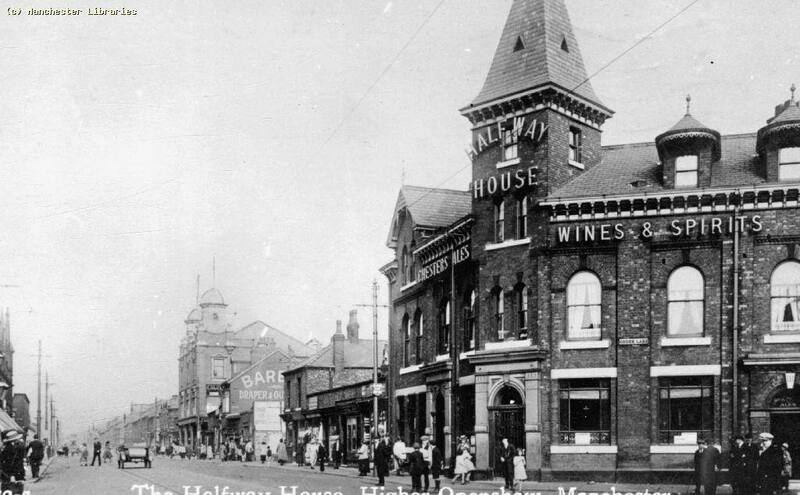 By then wages would have increased substantially and there was more discretionary spending money around, but there remained a lot of pubs in relation to the population, and I don’t recall any pubs going out of business until Openshaw was pulled down and “improved”. 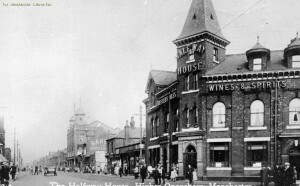 Most pubs were owned by breweries, and were tied houses, that is, they sold only the drinks made by the brewery owners. The landlord would have been a tenant, paying a rent, and keeping the profits from the sales. Keeping a single supply chain presumably meant that costs could be kept lower with profits shared between tenant and brewer, but even so, there were an extraordinary number of pubs. Pubs were very different places in the 1950s. They were for drinking and sold alcohol or minerals only, if you had asked for a coffee you would have got a very curious look. Food was restricted to packets of nuts and crisps (plain with a twist of salt), and it as rare to find one selling sandwiches or pies. An occasional vendor might come round on Friday or Saturday selling packets of cockles or shrimps. They all had brown ceilings from years of heavy smoking. Most had darts boards, a few had shove ha’penny boards. Most pubs had two bars, the public for most of the drinkers, and the saloon for the more refined, or those looking for a quieter time. Drinks were a penny or two more expensive in the saloon. Children were not allowed, and when dad and mum were out together it was common to see kids sitting on the pub doorstep, kept quiet with a bottle of lemonade and a packet of crisps. Opening hours were strictly controlled by law, and all pubs closed, theoretically, at 10.30 pm through the week and 10 pm on Sundays. Most localities had a few pubs that were flexible about closing, but a wary eye had to be kept open for patrolling policemen, and the noise had to be kept down. A landlord could lose his licence for persistent offending. I have the impression that the difference in price between the off-licences and pubs then was not as high as it is now, with supermarkets using alcohol often as a loss leader. This kept the pubs busy, and a night’s drinking was not as heavy on the wallet as it is now. My first drinks would have been occasional pints of bitter in the mid-fifties at 1/6 a pint-that’s 7.5 pence in new money, which would be about £1.75 now. Which is about a half what you would pay in most pubs today, so the relative cost of drinks has increased dramatically. This helps, I suppose, to explain the large number of pubs, but still leaves the puzzle about how profitable they were. The working men’s clubs were very popular for several reasons, not the least being that they were cheaper than the pubs, by reason of not making profits. They were always busy and were more sociable, with many more women drinking there. They organised dances, social evenings, and outings to the panto, Belle Vue, maybe even the seaside. 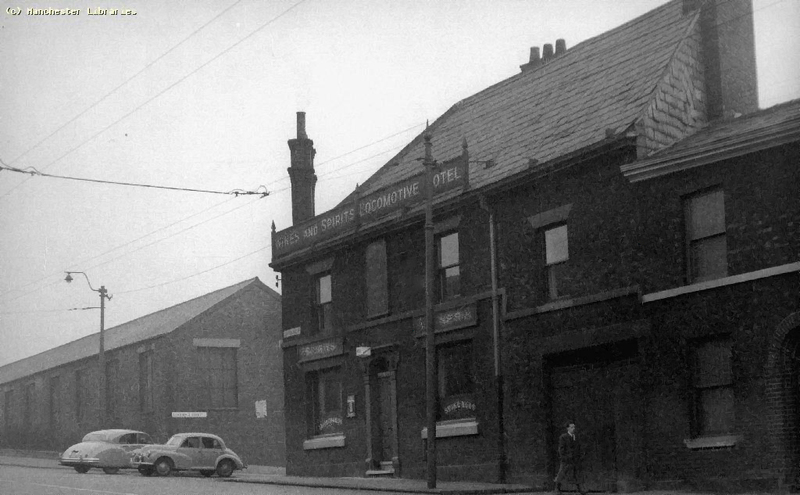 My parents used the Gorton & Openshaw Working Men’s club almost exclusively, because if its friendly atmosphere, and it was just a few yards across the street. The Locomotive pub was on the corner of our street, even nearer than the club, but I have no recollection of dad ever drinking there. If he did, it was a very rare occasion. My own drinking history of Openshaw was very limited. I left Openshaw for good when I was 24, and most of my socialising in my early twenties was in central Manchester, a lot of it in jazz clubs, with workmates and ex-school mates who were spread around Manchester. I think I went into the Loco twice, and not much more into the club. Which is why this piece is mainly about pubs in general, and not Openshaw pubs in particular. Pubs in the 21st century are very different places. It’s rare to find one that doesn’t sell food, coffee and wines, and many of them look more like restaurants than pubs. Many reasons why this is, a major one being the very strict enforcement of drink/drive regulations. Selling less alcohol means that revenue has to be made somewhere else, and factory supplied food has meant that it’s easier to provide a varied menu at reasonable prices. A lot of this change is for the better, but along the way the pub has lost a lot of its character in trying to be something more than a drinking establishment. My parents owned the off licence just by the lights on Ashton Old Rd, and further along the tailors shop – Wilkinsons. At that time there was a decorating shop on the corner. Next to the tailors was a bakery. – A little later than most of the entries on here – probably late 60’s – early 70’s. my great uncle was the landlord of the Vulcan, the Monkey, in the 50’s. his name was George Murray. i have very little information about him. i believe he had a son and daughter but i only went to the the pub once as a very young boy. does anyone know of him and his family? I think my uncle Derek held the record for being banned from the most pubs in Openshaw! A feat he was strangely proud of. Hi did anybody go to ST Barnabas primary school? In the 60s it was situated at the bottom of south street, my teacher was Mr Wade his nick name was pop Wade totally loved that school many happy days there. 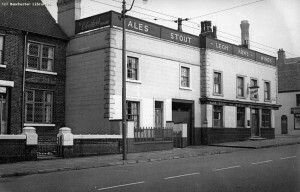 l remember the midland pub on gorton road we lived at 24 gorton rd about six doors down from pub. We left the area in 1961. I do, was my job to run there every Friday night to get the Tea. 3 Cod, 3 Chips, and peas, for four of us. They didn’t call them mushy peas in those days, they were just peas. I remember going to the Napoleon on Cornwall street in openshaw on Friday nights, where they had fantastic acts with the likes of wee willie Harris, jess Conrad, Heinz, screaming lord sutch ect, sometimes these all appeared together on the same nights. Many good nights, & happy memories we had there. Do you mean the railway line that crossed Ashton old road…? It was a service line for the English Steel Works wasn’t it.? See the pic on the link here! I used to be friends with the White Horse Landlords son he was called Lance Lucas. Hi Steve– so you’re still around then, lol! Are you still on the bt email address? I wondered when a name I recognised would show up on here. Reading the posts gives the impression that most seem a bit older than us- still a good website, and a sign that we ourselves are knocking on a bit now, is the fact that we are looking at it too. Seasons Greetings mate, ‘tek it easy’! Sorry only end up here by accident looking up old memories, have lived in London for 30 years, hence the nickname steve the manc. How the devil are you and how’s that truant playing twin brother of yours Nigel? The original list of Pubs was compiled by myself and posted as Pubs on Ashton Old Road, not as Pubs in Openshaw. Peter Brown, your friend is correct the Pub on Wood street was called the White Horse. Not sure if you can help, a friend of mine used to work at the English steel and can remember a pub on Wood Street which was directly behind the Lord Wolesly and he thinks it may have been called the White Horse or White House. I grew up in Openshaw from 1965 ish but can’t recall the pub so would like to know if you could throw some light on the subject. It was the White Horse. I was mates with the Landlords son his name was Lance Lucas (the son not the dad) I lived and was born in Bartlett Street (not the street, a house, No 16) .